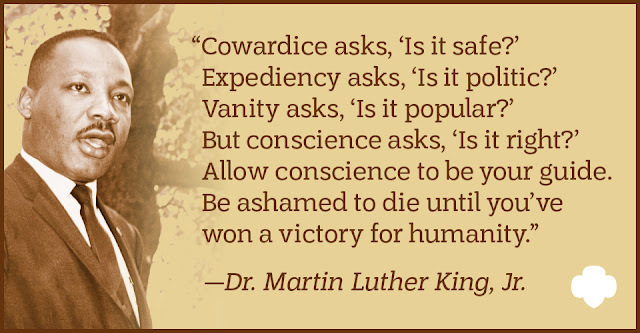 Today, we remember the life and legacy of Dr. Martin Luther King, Jr. Dr. King was a shining example of the G.I.R.L. Agenda in action; he fought fearlessly for the rights of American citizens, and did his part in ensuring he raised civically engaged children, as well. Now, at a time where more girls of all ages are championing real change, we honor the legacy Dr. Martin Luther King, Jr. leaves behind, through the eyes of his son, Martin Luther King, III. 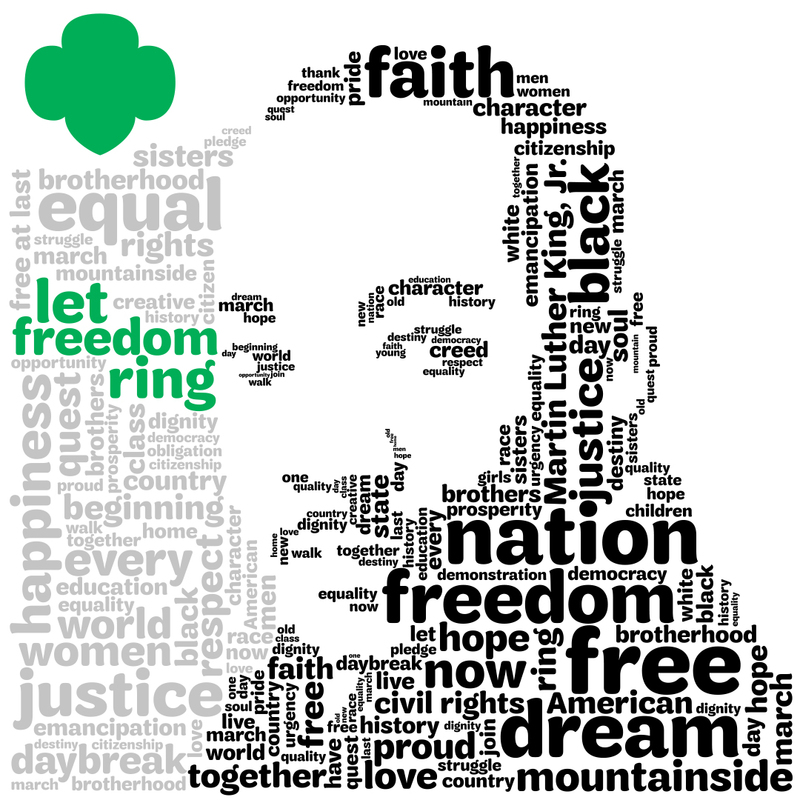 Without a doubt, Dr. King was man enough to be a Girl Scout. 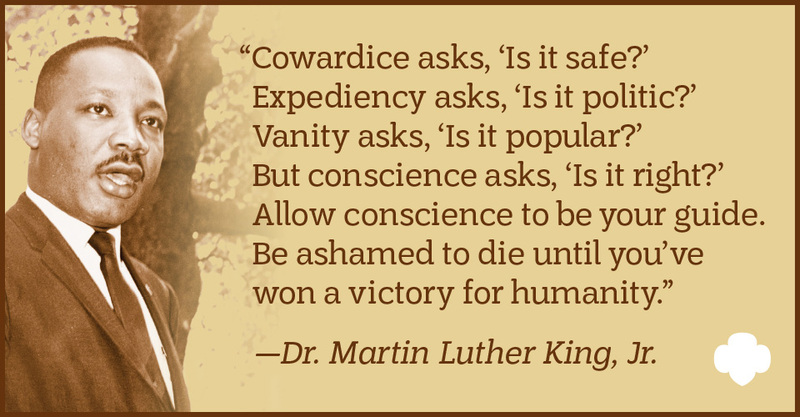 By the age of 39, Dr. King had successfully spearheaded a movement marked by freedom, justice, equality, and nonviolence that lit a fire under Americans of all colors and creeds. His dream for this nation was progress—progressing from the unjust laws and practices that disrupted lives and families of color, including his own. On April 4, 1968, when a gunman took his life at the Lorraine Motel in Memphis, Tennessee, the world mourned the loss of a leader. Today, we mourn the loss of a unifier in a time of great division. But for the King family, their loss was an intimate one and still is today. They didn’t just lose Dr. King; no, they lost Daddy. They lost a husband, a son, a provider, and a friend. As we commemorate 50 years since the assassination of a hero, let’s also honor the King family and the strength they’ve exhibited as they work to uphold his legacy. On Monday, February 19, 2018, Martin Luther King, III spent President’s Day in Richmond, Virginia, reading his children’s book, My Daddy, Dr. Martin Luther King, Jr. It’s that very title that inspired us to get to know Dr. King on a more intimate level. Sure, there’s the MLK we research online and in text, but who is MLK the “Daddy”? “He was just Dad to us,” recalls Mr. King with a smile. Though just ten years old when his father was killed, Mr. King vividly remembers the man behind the marches and demonstrations. He was the simple, loving father who put his children on top of the refrigerator and let them jump into his arms. When he wasn’t playing in the front yard, Dr. King brought his children along to the local YMCA, where he’d spend hours swimming and getting a massage. That was his primary form of exercise, so of course, he taught his children to swim during the weeks spent regularly visiting the gym. But perhaps the most glaring example of the type of father Dr. King was came in the early 60s, when his children decided they wanted to visit the amusement park they’d pass during car rides to and from the airport. And he did. Around 1963, the King family visited FunTown for the first time, an occasion so joyous the children forgot they were once banned from ever entering. Dr. King stayed with his children every step of the way, enjoying every rollercoaster in the park. To innocent children shielded from the gravity of Civil Rights struggles, admission into FunTown was the ultimate victory for desegregation efforts. “It was the most wonderful experience of my life,” beams Mr. King. His father’s commitment to global equality never eclipsed his commitment to developing conscious young citizens. On Saturdays he’d return home and prepare his sermon for the next day, and on Sundays, his wife, Coretta Scott King, made breakfast, prayed, and had each child recite their Bible verses. Each breakfast ended with meaningful dialogue about common issues Dr. King was engaged in, such as voting rights and desegregation. Such discussions were necessary; yes, the King children needed to understand why Daddy spent so many nights away from home, but they also needed context behind the vitriol spewed over telephone lines. “My mom did an excellent job of shielding us as well as she could,” he remembers of Mrs. King. In fact, the naive King children knew so little about their father’s prominence that they’d play on the phone when strangers from a mysterious “White House” called their home. Despite how brutal conditions remained outside their doors, and despite how difficult the road remained for Dr. King and his team, Mrs. King made it her mission to protect her children’s innocence at all costs. On April 4, 1968, that protective shield shattered, and life as the King family knew it would be forever changed. While watching TV one evening, Mr. King and his siblings learned that their father had just been shot. Mrs. King returned home to her children and comforted them with words that remain forever engraved in Mr. King’s memory. Mr. King recalls how consoling and comforting her words were in that harrowing moment. He didn’t ask a single question. Today, he remains dedicated to achieving his father’s dream, and knows that the society of freedom, justice, and equality is still a tangible goal, and one we’re slowing working our way to. This interview was conducted by Janna M. Hall and was adapted from a piece that originally appeared in Urban Views RVA.